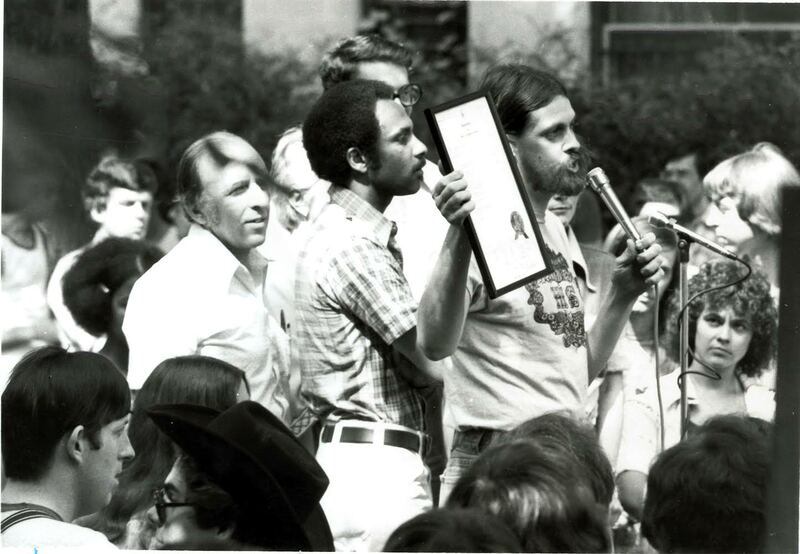 "The photo of the bearded long-haired hippie holding the proclamation is, indeed, me [Deacon] and it was taken in 1975. The African American man next to me is John A. Wilson who, at the time, was the Ward 2 Councilmember who had introduced the Council’s Gay Pride Proclamation. Wilson continued to serve as Ward 2 Councilman from 1974 to 1991 when he was sworn in as Council Chair, a position he held until his death in 1993. Immediately behind Mr. Wilson is Franklin Kameny, The “godfather" of the LGBT community in DC. And the dark-haired guy in black thick-rimmed glasses partially visible to Mr. Wilson’s left was Cade Ware, who was President of the GLAA at the time." “1975 Gay Pride Day Photograph,” Rainbow History Project Digital Collections, accessed April 23, 2019, https://archives.rainbowhistory.org/items/show/1633.